So far Robby McDonald has created 13 blog entries. 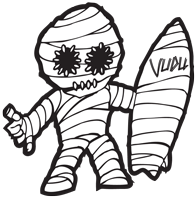 It takes a lot to make a Vudu Surfboard. It takes crisp, white surfboard foam, thanks uncle Rod from Xtra Foam. It takes a talented shaper, thank you Jeremy Fowlkes. It takes an experienced glasser, thank you Heimish. It takes a flawless sander, thank you Ivan. Pull in to Vudu Surf and we can make sure you get the best wet suit at the most reasonable price!